The Fed will be sticking to its "patient" approach to interest rate changes and portfolio runoff. The economic data that continues to pour in remains mostly neutral in regard to the bigger picture. Momentum increased for six of the 11 sectors and all but three of the factors last week. Momentum in the global sector increased in all but two regions, Japan and Pacific X-Japan. The CEOs of some of the largest U.S. banks are in Washington today to testify to the House Financial Services Committee. The hearing was called by the Democrat-led House to review the impact of banks since the financial crisis about 10 years ago. Wells Fargo analyst Mike Mayo points out that American savers have lost approximately $500 billion in interest payments on bank accounts and money market funds due to post-financial crisis policies by the Federal Reserve. His note also states that rates on $6.6 trillion of interest-bearing accounts would have been about 100 basis points higher over the last decade if, in part, banks hadn't behaved so irresponsibly. Despite the punishment to savers, Donald Trump still urges the Fed to cut rates to spark economic growth, CNBC reports. As many are tuning in to the "Holding Megabanks Accountable" testimony, Trump is probably awaiting the release of the Fed's March meeting minutes today. According to The Wall Street Journal, the minutes will provide "more detail about officials' discussions where most signaled they didn't expect to raise interest rates this year" and how officials view the risks to their forecast of the economy expanding 2% this year. Projections show 11 of the 17 participants in the policy meeting do not expect rate changes. Another issue Fed officials are typically concerned with is inflationary pressures. According to the Labor Department, the Consumer Price Index rose 0.4% in March, boosted by gains in gasoline, rent, and food, reports Reuters. Prices are now up 1.9% in the 12 months through March, in line with typical inflation expectations of 2% by the Fed. At the press conference in March, Fed Chairman Jerome Powell stated, "What I see is inflation that's close to 2% but that sort of keeps bumping up against 2% and then maybe moving back down a little bit. I don't feel that we have kind of convincingly achieved our 2% mandate in a symmetrical way." As has been repeatedly mentioned, the Fed will be sticking to its "patient" approach to interest rate changes and portfolio runoff. The economic data that continues to pour in remains mostly neutral in regard to the bigger picture. With signs of either economic slowdown or stability across different regions, the Fed will remain stable with its decisions. Their outlook will be further highlighted in the meeting minutes today at 2 p.m.
Sectors: The average momentum score for the Sector Benchmark ETFs increased from 22.00 to 24.18. Momentum increased for six of the 11 sectors last week. Materials' score, which jumped 10 points, increased the most, moving the sector from eighth in rank to fourth. Technology remained the top sector, while Discretionary overtook Real Estate for the second position. 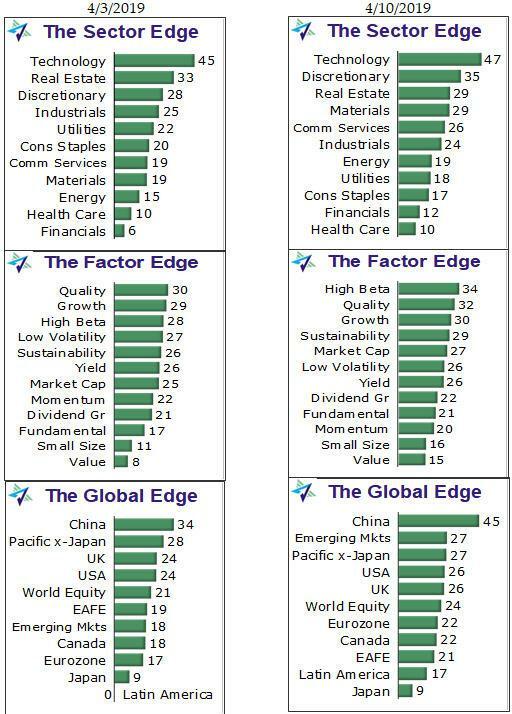 Factors: Among the Factor Benchmark ETFs, the average factor score increased from 22.50 to 24.83. Momentum increased for all but three of the factors last week. The score for Value, which gained 7 points, increased the most. High Beta overtook Quality and Growth for the first position, while Quality and Growth remain in the top three positions. Small Size and Value remain the two laggards. Global: The average Global Benchmark ETF momentum score increased from 19.27 to 24.18 for the week. Momentum in the global sector increased in all but two regions, Japan and Pacific X-Japan. Latin America had the largest increase, gaining 12 points, but it only went from last in rank to second to last. China held on to the top spot, while Emerging Markets jumped from eighth to second in rank.